Qatar Diabetes Association (QDA), member of Qatar Foundation, together with Qatar Biomedical Research Institute (QBRI), part of Hamad Bin Khalifa University (HBKU) organized a lecture for parents of children with type 1 diabetes. The lecture also provided the wider community with an in-depth overview of stem cell research. 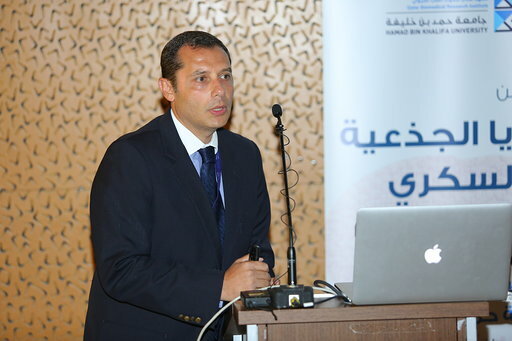 The lecture was led by QBRI scientists, Dr. Mohamed Emara, who touched on the subject of the latest advanced research in stem cell technology; and Dr. Essam Abdelalim, who discussed diabetes, stem cells therapy, and the global research being conducted to improve the treatment of the disease. Members of the audience, including parents of children with type 1 diabetes, were given an opportunity to raise questions to QBRI’s scientists pertaining to the disease and the latest developments in the stem cell research and potential treatment for their family members using this new technology. “In addition, we are so pleased that parents of children living with diabetes responded to the abundant and valuable scientific information, which confirms that there is important and promising research underway at QBRI. We are eagerly keeping an eye on the work of QBRI scientists and their efforts to produce pancreatic cells that secrete insulin in laboratories in efficient and large quantities for future use, to replace infected pancreatic cells,” he explained. QBRI is home to three research centers – Cancer Research Center, Diabetes Research Center, and the Neurological Disorders Research Center. The Diabetes Research Center serves as a catalyst to promote innovative research on both type 1 and type 2 diabetes and related metabolic disorders, with the aim of gaining fundamental knowledge to enhance the understanding of social, molecular, and genetic causes of the disease.